Please visit and like our Facebook page and Instagram feed. Sign up for our monthly email newsletter below to learn about upcoming events. See our past newsletters here. See below for directions to the DOT Gardens. How did you hear about the DOT Gardens? 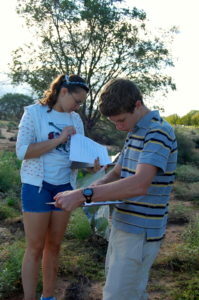 The Desert Oasis Teaching Garden is located on the campus of the Albuquerque Academy. To visit, enter the Academy at Wyoming & Burlison NE, turn right, then take your third left to get to Parking Lot #6. Our Welcome Center is right next to the parking lot, and up the hill near the Science Building is the Garden.